With the recent trend going on in the market of making a mini version of the flagship smartphone, we have got some interesting news regarding the Xperia Z1 mini device. 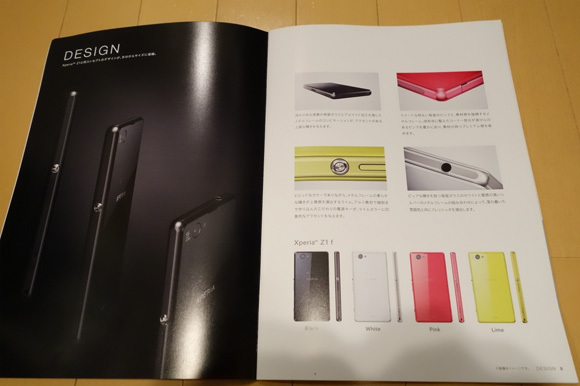 The latest leaks show brochure pages showing the images of Xperia Z1 mini from different aspects. A little while ago, Japanese carrier NTT DoCoMo also confirmed that Xperia Z1 mini, also named Xperia Z1 f, will be coming out this year. Interestingly the brochure also shows different color options available with the Xperia Z1 mini. The images show four colors – black, white, red and yellow. It is still not confirmed whether these colors will be exclusive to the Japanese carrier only or will it be available for all. The color choice for the Xperia Z1 mini looks interesting and this is the first time we have seen that a mini device of a flagship product has different color than its big brother. The color combination of red and yellow might be influenced from the colors of the new iPhone 5C that was announced just few days ago. Xperia Z1 mini looks as cool and sleek as its big brother but it is said that Xperia Z1 mini is a bit thicker than the Xperia Z1 – 9.4mm against the 8.4mm for Xperia Z1. We are yet to hear anything official from Sony about the actual release date and the price of the Xperia Z1 mini. But according to the sources, the Japanese carrier DoCoMo is going to announce their new intake of smartphones on October 10th and we might see Xperia Z1 mini at the announcement as well. But stay tuned for more information about the Xperia Z1 mini.